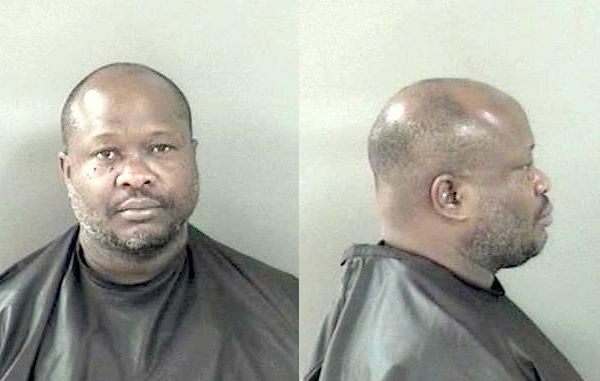 VERO BEACH – A 46-year-old man was arrested after he punched his girlfriend in the face, causing her to be knocked to the ground at the Speedway in Sebastian. A Sebastian Police officer was on routine patrol when a pedestrian flagged him down at the Speedway. He said a man punched a woman before leaving in a blue Dodge Charger. Police located the vehicle about a block away in Sebastian. Both the driver and passenger were out of the car as police arrived. The female passenger was crying, and the man had a small drop of blood under his right eye. Theophilus Strapp told police that his girlfriend scratched him under the eye, causing him to bleed. The woman said the two were arguing in the Dodge Charger, which they just purchased. Witnesses at the Speedway said the couple from Vero Beach pulled into the parking lot of the gas station and began yelling. The woman tried to walk away from the car, but Strapp ran after her. “Strapp got in her face and hit something out of her hand” and defended herself by slapping him twice. Strapp then “punched her in the face, knocking her to the ground,” according to the report. Police determined that Strapp was the primary aggressor. He was placed under arrest for domestic battery. As officers searched Strapp, they located a small wad of aluminum foil in his left pocket of his pants. They asked him what the item was, and he replied “it’s crack. I smoke it,” the report said. Police then found a baggie containing 4 12 prescription pills, which he stated were Oxycodone. A crack pipe and two small rocks were found in the vehicle. Police then found an H&K semi-automatic handgun with a hollow point ammunition in the magazine. The Vero Beach man was also carrying $1,066.95 in cash. Officers believe the money is consistent with sales of illegal narcotics and was seized. The crack cocaine and pills tested positive. Strapp, who told police he works as a dishwasher, is a convicted felon who was in possession of the firearm and ammunition. Strapp was transported to the Indian River County Jail where he was charged with felony possession of cocaine with intent to sell, felony possession of a firearm by a convicted felon, felony possession of a controlled substance, drug paraphernalia, and battery domestic violence.